UCLA has joined the Billion Dollar Green Challenge, a national effort to create a billion dollars of revolving funds at universities. The UCLA Energy and Sustainability Revolving Fund, the largest of its kind in the nation, continues the university’s decades long commitment to energy and resource efficiency. Past initiatives have included heating ventilation and air conditioning (HVAC) upgrades, lighting efficiency, occupancy sensors, and more. UCLA has invested over $20 million in energy efficiency in the past decade and achieved over $4 million in annual energy savings. This new commitment of a $15 million revolving fund will encourage and support new projects across campus and will continue our building audit and Energy Conservation Measures program. Energy efficiency and conservation are a critical part of the university’s strategy for achieving carbon neutrality by 2025. UCLA is a living laboratory for sustainability research, demonstrating that it is possible to address complex global issues like climate change in a financially feasible way. At UCLA, we practice what we teach. More details about UCLA’s climate and energy initiatives can be found here. If you would like to donate to the fund please visit this page. 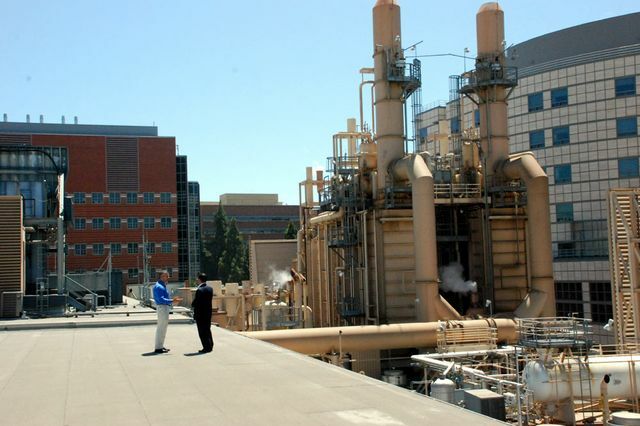 UCLA produces 90 percent of its own energy with its highly efficient cogeneration plant. Professors work with staff at the plant to develop pilot projects in energy and water efficiency. UCLA on Tuesday announced the creation of a $15 million self-replenishing fund to support campus sustainability projects, forming the largest fund of its kind in the country. UCLA has already invested $20 million in energy-efficient building retrofits during the past five years. It is the 46th institution in the nation to join the Billion Dollar Green Challenge, which encourages colleges and universities to create their own sustainability-focused revolving funds — pools of money that are continually replenished when loan recipients return some or all of their cost savings each year. Nurit Katz, UCLA’s chief sustainability officer, said creating the UCLA Energy and Sustainability Revolving Fund is a way to acknowledge that sustainability isn’t just a way to help minimize climate change — it’s a good financial investment, too. Previous projects at UCLA have included the installation of thousands of occupancy sensors that turn off lights when rooms or hallways are empty; massive retrofits of heating, ventilation and cooling systems; and campuswide replacements of old light bulbs with significantly more efficient models, in classrooms, auditoriums, streetlights and parking structures. Now, the savings from those types of projects will fund future projects, Katz said. Establishing the fund also supports the campus commitment to make Los Angeles fully sustainable in terms of energy, water and biodiversity, the goal of the first UCLA Grand Challenge Project. The new green revolving fund could help support UCLA projects that will develop and test new technologies and interventions aimed at reducing water and energy use as well as supporting biodiversity, first on campus and later in Los Angeles at large. The fund will be created through bond financing and will not use tuition or student fees. Supporters will also be able to donate to the fund to support sustainability at UCLA. With UCLA’s $15 million, the nationwide total for the Billion Dollar Green Challenge now has reached more than $100 million. Other members include the University of Vermont ($13 million), Harvard University ($12 million), Caltech ($8 million) and Princeton University ($5 million). The challenge was created by the Sustainable Endowments Institute in 2011. Membership in the challenge gives universities access to the Green Revolving Investment Tracking System, or GRITS, which helps them calculate the money, energy, water and other resources they’re saving, and to a database of projects from other institutions. Participants also receive consulting support, share best practices, and get guidance for setting up their revolving funds and finding other funding sources, said Mark Orlowski, executive director of the Sustainable Endowments Institute. The library of previous projects — more than 300 and counting nationwide — can also be a rich source of data for professors or students to mine for research, Orlowski said. Orlowski announced UCLA’s participation in the program Tuesday morning at the Association for the Advancement of Sustainability in Higher Education’s annual conference in Portland, Oregon. This fall, UCLA will identify projects to fund as part of its third annual energy audit of select campus buildings. A review committee will develop project guidelines and begin soliciting applications by January.